With over ten years’ experience providing modular platforms we have gained a vast knowledge of every aspect of working on water. We use that knowledge to support our clients from initial enquiry through to removal. We respond quickly, arrange site visits and provide a bespoke solution. The core values; safety, quality, service and innovation embedded at the root of our business are reinforced in every project we embark on. As a pioneer in new markets, our contribution to all projects is of the highest standard possible. 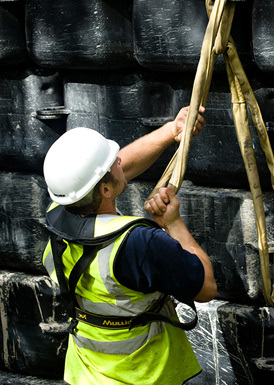 Using the best materials we guarantee a quality service working to the highest possible safety guidelines and have an ongoing commitment to health and safety working closely with the HSE as we forge our own codes of practice. Horsham District Council and The Environment Agency appointed BAM to improve the standard of the earth dam overflow at the Warnham Mill Pond Reservoir by installing sheet piliing at the face of the dam. Pontoonworks provided a manoeuvrable 60m² working platform for this £1.1million project. 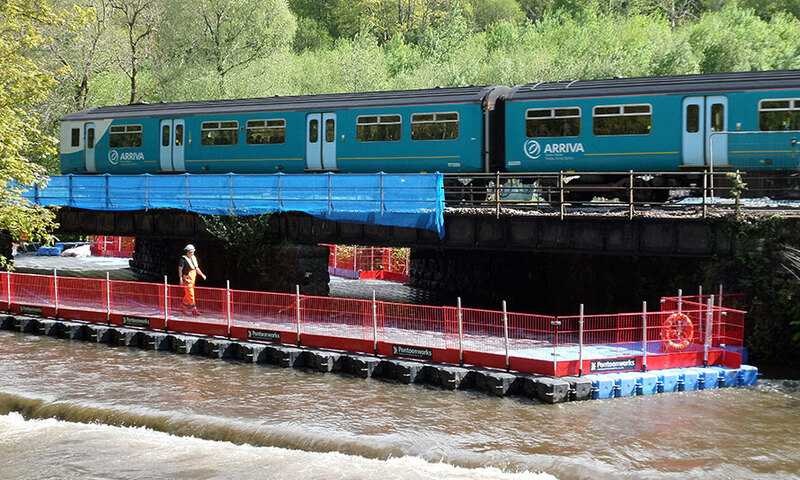 A bridge works project on the River Cynon in Wales required an engineering access solution which provided a stable platform for a piling rig and a debris fall arrest system on a section of flood river. 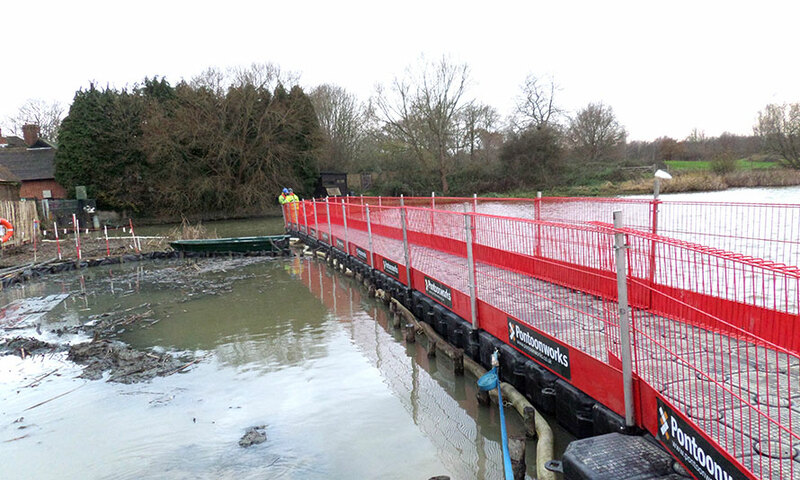 A 700m² single layer pontoon installation with gangway and Combisafe fencing offered a solution to our customer. The installation allowed their team and contractors to safely complete extensive demolition works on a main line rail bridge floating 2, 6 tonne excavators without any need for a possession order. Essential repairs to the Selby Swing Bridge steelwork, hydraulics, beams and paint work took place in 2014. 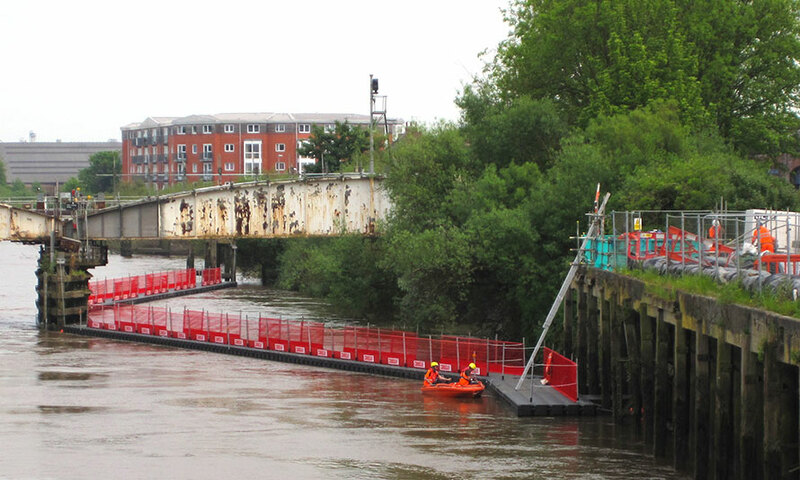 Pontoonworks provided a deflection pontoon to direct debris away from the scaffolding installed on the bridge. The river at this location is extremely fast flowing with a very large tidal rise and fall, spanning five metres. The team had poor access to the area, so we had to develop a mooring system which enabled us to install a pontoon in a harsh environment. As part of a major regeneration scheme approval for a new South Side Entrance at Leeds Station was given. Nothing could be transported to site by road, the waterway was the only way to access the work site and it is located within a designated conservation area. In addition there were major problems as the river could not be blocked, there was no access from the bank and providing a safe working platform for piling contractors in a fast flowing section of river required a thorough understanding of the inherent dangers. Pontoonworks provided the solution; 2 x 60m² modular pontoon barges each with a carrying capacity of 10.5 tonnes, 3 boats, numerous walkways, gangways, a bespoke landing stage with self-levelling gangway (walk to work, safe access to water course) an installation team and a 100 tonne jack up barge in the River Aire. We had become key contributors to a £17.4 million project and it was our expertise and fundamental understanding of working on water that got us there. 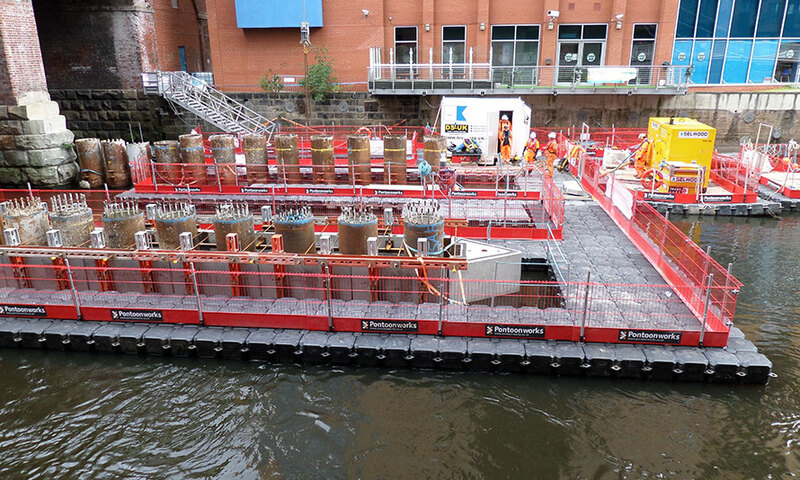 With a constantly evolving working platform our installation team and a fully qualified bargemaster played an integral part in the piling phase of the project providing the safest working platform possible. Civil engineering / surveys / marine civils / MOD / local authorities. We do the works.